Why Are People Addicted to Eating Ice? What Should You Do If You Are A Compulsive Ice Chewer? There are several strange disorders out there and one of them is pica. This is the desire to eat items that are not really food. This disease usually affects people and children who have developmental issues. 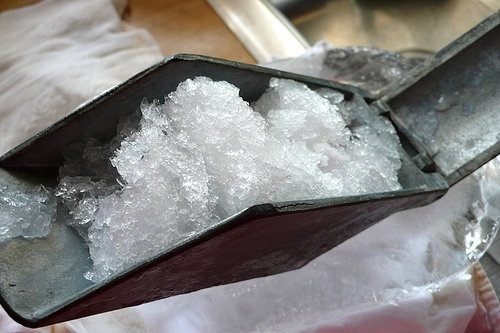 Among pica, pagophagia is the desire to eat ice all the time. Those who do this are often not aware that they have an issue, as they do not think that this is something to be worried about. So, is eating ice bad for you? It could be, and you should consult your physician to know if this has become an issue or not. In most instances, chewing ice has become a habit for the person. However, there can be an underlying medical condition that needs to receive treatment. For those who have the question "Is eating ice bad for you?" there are several issues that can be considered. When you chew on the ice cubes, you are doing untold damage to your teeth. This can chip and wear the enamel, which weakens the tooth. The more ice a person eats, the more damage he is doing to his teeth. What's more, it is permanent damage. Those who are addicted to chewing ice will find that their bodies can suffer nutritional problems. Many people who do nothing but eating ice are often malnourished and have other health related issues. This is one danger of eating ice that many people may not take seriously, but eating ice really can have some social effects on the people who do it. Many people do not like to go places with or sit near someone who constantly chewing or eating ice, so it could affect just how many friends you have. Many people view eating ice or chewing ice to be nothing more than a habit. However, there are several reasons why a person may eat ice. A person should have at least 8 to 18 milligrams of iron in their diet daily. Studies have found that those who have this level of iron are less likely to have a craving for ice. Those who have low iron are often found to be munching on ice. However, it is not sure why the low iron makes a person crave ice. Many studies have suggested that the ice may help to reduce tongue swelling and burning which are often associated with low iron levels. There are many people who eat ice as a way to keep from eating other foods in an effort to lose weight. The person will eat the ice in between meals as a way to suppress the appetite. However, there have been no studies that show this technique actually helps in losing weight. Eating ice is often nothing more than a habit for people who simply want to have something in their mouth to chew on. This can become an obsession when a person finds that he can no longer do other things for wanting to chew on ice. Cool ice can relieve the nausea feeling caused by food poisoning, motion sickness, pregnancy or influenza. It can also prevent dehydration. This is why some patients want to eat ice, but for nausea relief, you'd better let the ice melt in the mouth instead of chewing it. For those who find that they are chewing ice constantly and many times without thinking, chances are they have low iron. This will require to see the doctor in order to get this tested and to figure out the best method to solve this issue. Those who did correct their iron levels often find that the desire to chew ice is gone. If low iron is not the problem, other issues may be dry mouth or simply a habit due to boredom. If your habit becomes an obsession, it is important to take care of this in order to avoid it interfering with your life. This will require the help of a medical professional who knows what could be signals of this type of compulsive behavior and how to treat it.